An icon of Chandrapur, Mahakali Mandir is symbolic to Chandrapur city and people of this city have great feeling for this temple. 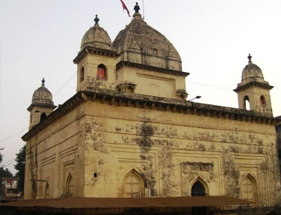 Devotees and travelers visit Mahakali Mandir daily but many visitors flock to this place on Tuesdays as it is considered as a special day to visit this temple. There is also a Small Shri Ganesha temple and Hanuman temple inside the premises of the mandir. The temple is crowded by devotees in the month of April, especially on the eve of Hanuman Jayanti. All kind of facilities like drinking water, accommodation, and prasad distribution are available in the temple premises. There are two entrances, one featuring Lord Hanuman and a rear entrance featuring Lord Ganesh and a Shani Temple.